O n 18th February, HH Niranjan Swami gave the morning Bhagwatam lecture on SB 6.17.30. Below is the transcript of the lecture. First I would like to thank all of the assembled vaisnavas for this opportunity to render service. I pray to all of the vaisnavas who are here today to bless me that I may render this service with some devotion. For only then can these words be pleasing to the vaisnavas who are always eager to drink the nectar, honey, from the lotus feet of the Lord. I just noticed this morning that this verse is, interestingly, spoken by Lord Siva. Since today is also Sivaratri, it is appropriate to say something that he has given to us. It is also the Kirtan Mela and I’ve been requested to say something about the chanting of the holy name. I thought this verse was very appropriate because in the purport, Srila Prabhupada speaks very clearly about the mercy of Sri Caitanya Mahaprabhu and how the holy name of the Lord can impact our lives, spiritually. This verse, as we said, is spoken by Lord Siva. The setting is him sitting with Parvati on Mount Sumeru. As we know, Chitraketu Maharaj had been flying above and was observing how Lord Siva was sitting with Parvati on his lap. He made some statement about that in a discouraging way. Visvanatha Cakravarti Thakura explains that this was arranged by the Lord so that Chitraketu Maharaj could very quickly be brought back to the spiritual world. That the devotees do not fear any condition of life. Whether they are in Heaven, Hell, or liberated, for them it is all the same. Devotees are fixed and interested in only one thing and that is to be engaged in rendering service to the Lord. Therefore Lord Siva, after speaking this verse, spoke about how the living entities who are not fixed in devotional service have to live with the conception of duality. Then he spoke in this verse. This is the next verse which says that as one mistakenly considers a flower gar- land to be a snake, or experiences happiness or distress in a dream, so in the material world by a lack of careful consideration, we differentiate between happiness and distress, considering one good and the other bad. In the eleventh canto of Srimad Bhagavatam, there is an interesting verse in this connection. This verse was spoken in a conversation between Narada Muni and Vyasadeva. Vyasadeva was inquiring about the nature of devotional service and how, by engagement in devotional service, one can become free from fear. Narada Muni quoted a conversation which had taken place earlier between the nine Yogendras and King Nimi. King Nimi had inquired in a similar way about the characteristics of devotional service. In that conversation, Kavi, one of the nine Yogendras, explained to King Nimi about the nature of fear and how it arises due to misidentification with the material body, and by being influenced by the external energy of the Lord. Then he explains that this is the nature of fear, that when one turns away from Krishna he forgets his identity as the servant of the Supreme Personality of Godhead. In the next verse he explains the exact same point which is mentioned in today’s verse. I’ll quote the verse as I remember it in English and then I’ll explain it because it is very enlightening. He says that although the duality of the material world does not ultimately exist, the conditioned soul considers it to be real, under the influence of his conditioned intelligence. This imaginary experience of a world which is separate from Krishna, can be compared to the acts of dreaming and desiring. When a conditioned soul dreams at night of something very wonderful or something very horrible, or when he daydreams of something he would like to have, or something he would like to avoid, he creates a reality that has no existence beyond his imagination. The tendency of the mind is to accept and reject things on the basis of sense gratification. The intelligent person therefore must control the mind, restricting it from the tendency of being in the illusion of seeing things separate from Krishna. When the mind is thus controlled, one will become free from all fear. That is the verse. Now I will explain it. It is a long verse. The explanation is very interesting. When I give the explanation, I try to bring it down to something that is very tangible, something within our realm of experience. The verse is actually bringing it within our realm of experience when it talks about dreams. 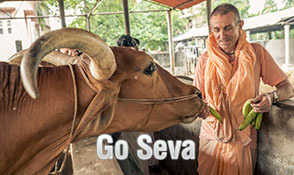 Srila Prabhupada often would give an analogy about how beneficial analogies are. He gives the analogy that if one wants to see the movement of the moon in the sky, when looking at it directly, it’s very difficult to see how the moon is moving. But when we look at the moon through the branches of a tree, it is much easier to see how the moon is moving. The branches are closer to us. They are closer to our experience. By seeing it through the branches we can see how it is moving. In the same way, the sage Kavi is giving us an analogy about the duality of the material world. He’s comparing it to dreams. Have any of you ever had a dream before? I think some of you may have experienced this. The next question is have any of you ever had a bad dream before? That is something within the realm of your experience. Have any of you ever had a good dream before? Yes. Something also within the realm of your experience. The sage, Kavi, is saying that when the conditioned soul dreams at night of something very wonderful or something very horrible, or when he daydreams of something he would like to have or avoid, he creates a reality that has no existence beyond his imagination. Now how is that? Just like, we may have a terrible dream. I’ve experienced it also. I fly a lot. I oftentimes experience that when I’m flying and I fall asleep I dream that the plane is dropping very fast. When I wake up, I’m happy. I feel very relieved. You may have had bad dreams. When you wake up you’re very happy. You may have a good dream. I’m not going to explain what a good dream is. You have to consider it for yourself. Generally, a good dream is very enjoyable. When you wake up, “Oh, it was only a dream.” You’re sad. But what is the nature of that happiness and sadness? It’s not connected to reality. It’s connected only to a dream. It has no connection to reality. We create a reality that has no existence beyond our imagination. Now that’s the night dream. Kavi also speaks about the daydream. The daydream, as Srila Prabhupada also says right here in this purport, is no different than the night dream. During the daydream, we dream of something we would like to have or something we would like to avoid. Sometimes, the anticipation of attaining what we would like to have in our daydream brings us great happiness. After attaining it, oftentimes we realize that it’s temporary and that realization in itself may lead to distress. Similarly, in thinking to try and avoid certain things we dream, “Oh yes. I’ve been able to avoid suffering. There- fore, I’m happy.” Some people even define their happiness by the fact that they’re not suffering. Somebody asks, “Well, how are you, Prabhu?” “Oh, things are good. I’m not suffering.” Therefore we live our life thinking about how to avoid suffering. This is not a very good mission for life, simply trying to avoid suffering. There’s more to life than avoiding suffering. We’ll talk about that later in relationship to the holy name. The sage Kavi is explaining to us that both the happiness and the distress connected to the dream and the happiness and distress connected to the day- dream creates a reality that has no existence beyond our imagination. Therefore the intelligent person must control the mind, restricting it from the tendency of seeing things separate from Krishna. That in this material world the conceptions of good and bad are all mental speculation. Therefore to say this is good and this is bad is all a mistake. It’s interesting that the word that is used here is manodharma, the religion of the mind. This is the dharma of the mind, to see duality. He’s speaking this verse to Sanatana Goswami. The body of Sanatana Goswami was filled with all kinds of sores due to drinking bad water in the forest of Jarakanda. He was feeling very distressed that Lord Caitanya repeatedly seemed inclined to touch his body. We should not think in terms of this is good and this is bad, when we think of it in relationship to the happiness and distress of the material world. Therefore Srila Prabhupada has made a very interesting point in this commentary. He says that the devotee accepts the distress of this material world with happiness, only due to the causeless mercy of Sri Caitanya Mahaprabhu. He is not speaking about material happiness. We have already spoken about material happiness and material distress in the world of dualities. The devotee who has transcended the world of dualities knows that both the happiness and distress of this world are both miserable conditions of life. He wants nothing to do with the happiness and distress of the material world. Rupa Goswami, in the Bhakti Rasamrita Sindhu, has defined three types of happiness. Happiness which is derived from sense enjoyment, happiness which is derived from liberation or from relief from the suffering of the material world, and happiness derived from devotional service. The happiness derived from devotional service is superior to the other forms of happiness. A devotee can accept the stress of this material world as happiness when he receives the causeless mercy of Sri Caitanya Mahaprabhu. Anyone who receives the merciful glance of Sri Caitanya Mahaprabhu, then the conception of liberation, for him, is like hell. kaivalyam narakayate. And the pleasures of the heavenly world are like a dream. Such is the nature of the heavenly pleasures of the heavenly planets. Then he says that the venomous serpents of the senses will become like serpents with broken fangs. They will no longer have any poisonous effect. When the venomous fangs of the serpent are broken, they cannot strike on an object and have a poisonous effect whatsoever. visvam purna-sukhayate The whole universe becomes ecstatic. The positions of demigods are like positions of insects. This is the result of obtaining the merciful glance of Sri Caitanya Mahaprabhu. The holy name of Krishna is completely transcendental. It bestows all spiritual benedictions because it is Krishna Himself, the Supreme Personality of Godhead. It is not a material name under any circumstance. It is as powerful as Krishna, Himself. It is always eternal and liberated. 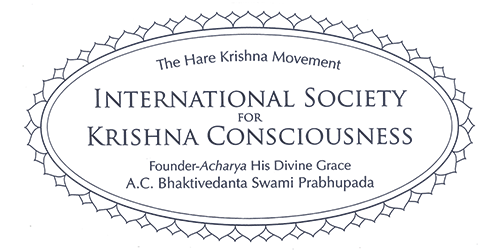 This is the nature of Krishna’s name. Krishna has so kindly made Himself accessible in His names. In the age of Kali, Krishna has manifested Himself in His name. For anyone who associates with His name, it’s as good as associating with Him directly. Certainly, he is delivered. So the Lord has very kindly made Himself accessible to everyone in the form of His name. As Srila Prabhupada explains in the commentary, and a very important point, that by His personal behavior, Sri Caitanya Mahaprabhu showed that He was never distressed, but always happy in chanting the Hare Krishna Mahamantra. One should follow in the footsteps of Sri Caitanya Mahaprabhu and engage constantly in chanting His names. Lord Caitanya came to teach by His example. By His example, He showed that he was always relishing the chanting of the holy names of the Lord. By relishing it, He was making the sweet taste of Krishna’s name available to others. This was Lord Caitanya’s method of distributing the holy name. This was Lord Nityananda’s method of distributing the holy name. This method of distributing the holy name was by first relishing it Himself, and then giving its sweet taste to others. Right here, Lord Caitanya in the house of Srivas Thakura, would relish the holy names of the Lord every night in the association of His most confidential associates. Those who were not His confidential associates were not allowed to participate. But then after relishing the taste of these sweet names with His associates, He, along with His associates, went out and distributed that sweet taste to others. Similarly, all of us have gathered to relish the sweet taste of Krishna’s names here in the association of devotees. But as servants of the holy name, we should never try to selfishly relish that sweet taste ourselves. Our duty is to go out and to give it to others. That is the auspiciousness of this event that has been created for all of us to take part in – to go together and to relish these sweet names. If we adopt the mood so nicely described by His Holiness Sacinandana Maharaj yesterday in his wonderful Srimad Bhagavatam class, of thinking of our- selves as very fallen and very much in need of mercy, and by qualifying ourselves in some way by prayer, in- tense chanting, and absorption, for the Lord to come down and to extend that mercy to us. This is how we should be very eager to obtain the darshan of the Lord. Not that we should be so eager to see Him, but we should open up and purify our hearts in such a way that He becomes very eager to see us. He will come and very kindly distribute that mercy to everyone who opens their hearts in sincere prayer and chanting the holy names of the Lord. We should pray to serve the Lord and to please Him. Not only by getting the opportunity to taste the sweet name, but eagerly being given the opportunity to distribute it for the welfare of everyone. This is real service to the holy name. This is what Srila Prabhupada also came to teach by his example.